The Contact Gallery in SalesforceIQ mirrors the contact gallery from your connected Gmail or Exchange email Accounts. The Contact Gallery is meant to be used as a online rolodex. As a best practice, we recommend that you track your Contacts (as well as Accounts) in your Lists. 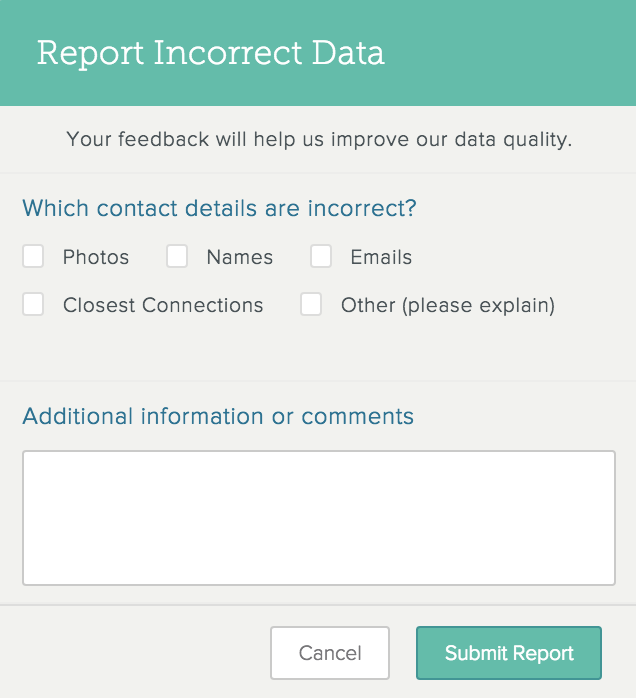 By default, SalesforceIQ enriches your Contacts with hundreds of different data sources. You can turn off the option to enrich Contacts with third-party data. Note that any Contact merges, shared Contacts from other users, or additional Contact details that we add in SalesforceIQ don't sync back to your Gmail or Exchange account. You can import Contacts manually via a CSV file or a VCF file import. Contacts are imported automatically via any connected email Account. You can connect an email Account during initial setup or at any time from the Settings. 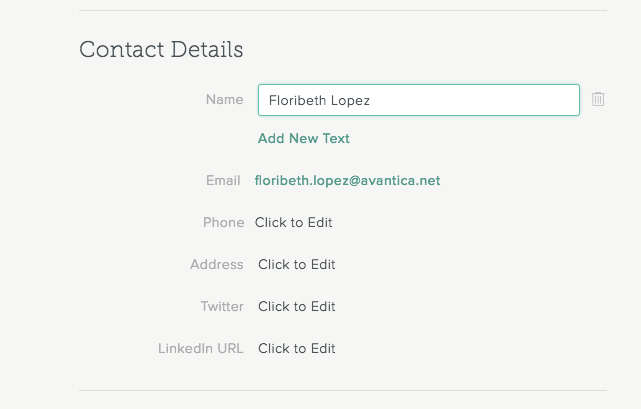 Contacts are also created when you add a new Contact or Account to a List. 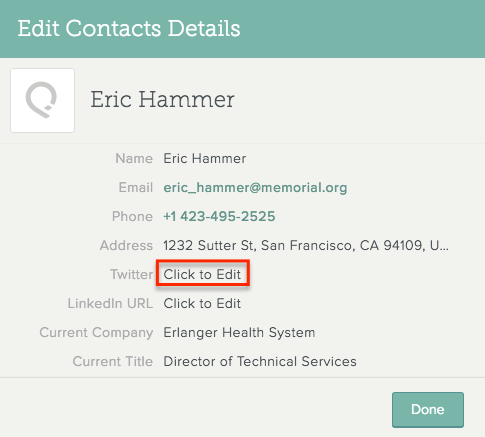 If you want to create a Contact that isn't associated with any List, you can create the Contact manually: Click in the upper-right corner of the screen, enter the Contact name, and click Create [Contact name] under People. You can also create a Contact directly in the Contact Gallery: Click at the top of the screen, select Contacts, and then click Add Contact. 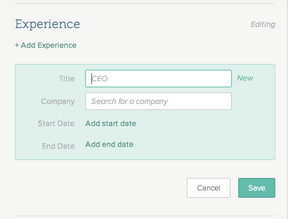 Enter the Contact in the search field, or click Create New Contact. If you create a Contact by mistake, you can archive it for the time being. You can later restore any archived Contact. 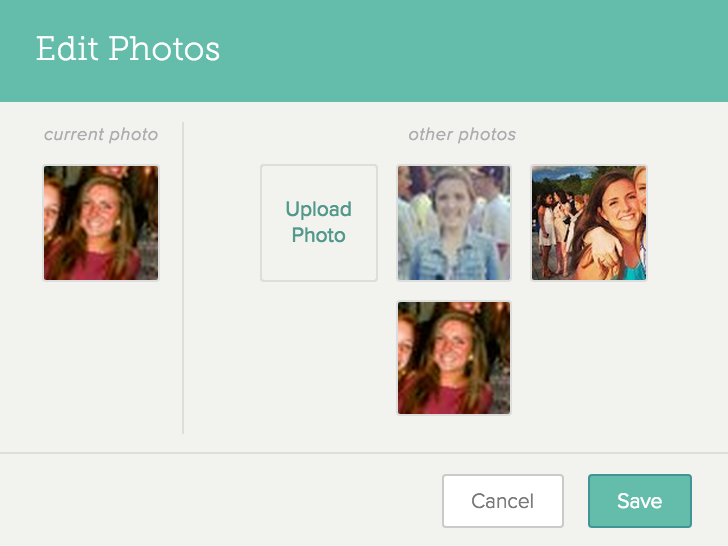 You can archive multiple Contacts at once. Archived Contacts are removed from the Contact Gallery entirely. Archived Contacts are also removed from any List object (Contact or Account) with which they are associated. So if, for example, you archive a Contact that is a Point of Contact for an Account on a List, that Contact no longer appears as a Point of Contact for that Account. Archived Contacts do not appear in search results. You can’t edit archived Contacts. Check the box to the left of each Contact name. Click to the right of the Contact name and select Archive. Click the Contact name and then click in the upper-right corner of the Contact Profile screen. You can restore any Contact you archived. Click and select View Archived Contacts. Click Restore at the top of the screen. 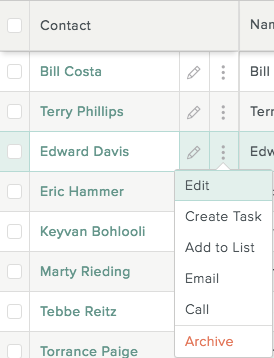 If a member of your Organization creates duplicate Contacts, you can merge them and retain all of the List data in one profile. 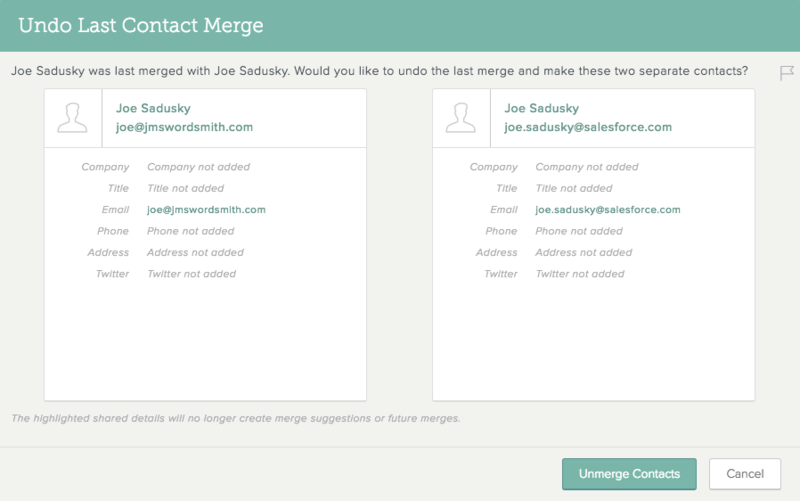 You can merge as many Contacts as you want. 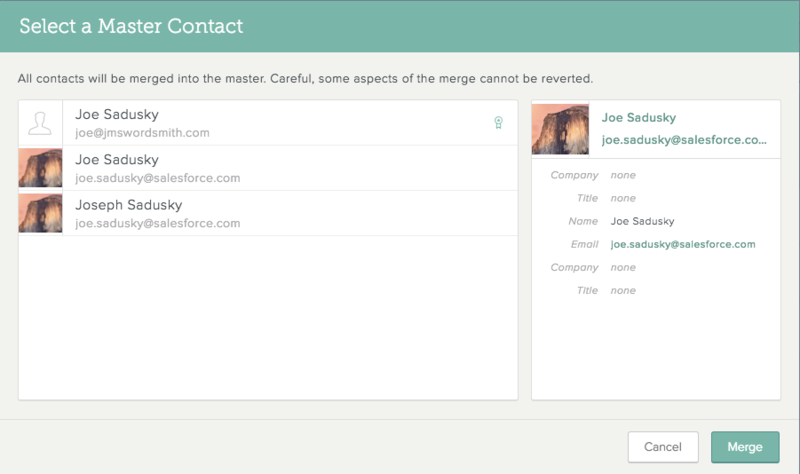 As part of the merge process, you can edit the combined Contact entry details so that the merged Contact contains exactly the information you want. Check the boxes to the left of each Contact name you want to merge. Click Merge at the top of the screen. Select one Contact as the master Contact. The entries will be merged under this master Contact. 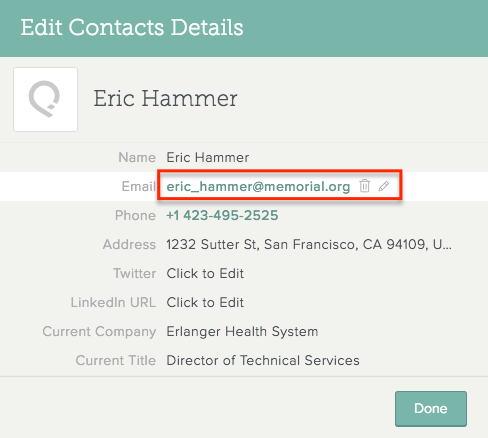 To make this information primary for the merged Contact (for example, the primary Contact name): Click . To delete this information from the merged Contact: Click . To edit this information for the merged Contact: Click . 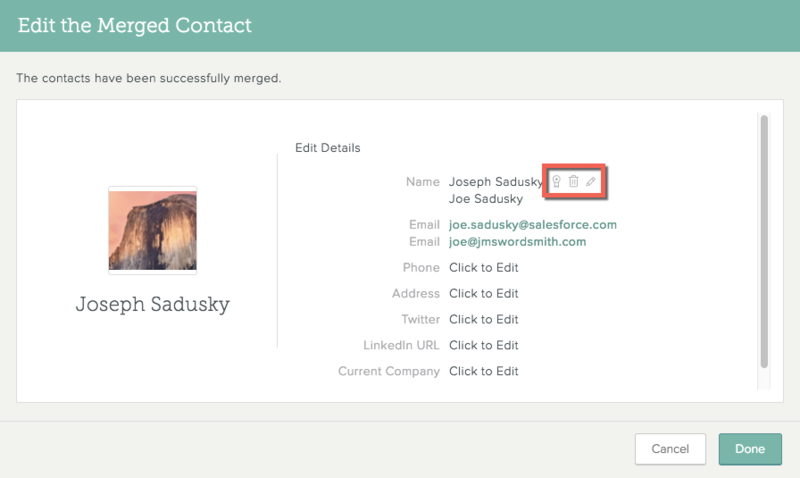 After you merge Contacts, you will have one Contact profile showing all of the associated entries by List name. 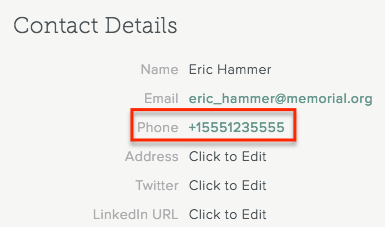 On the Contact Profile page, click Unmerge below the Contact name. Confirm the Contact details in the screen that appears, and then click Unmerge Contacts to confirm. Note: If you merged more than two Contacts, or if a Contact was merged two or more times, you need to complete the unmerge process for each merge. When you unmerge Contacts, existing Stream content doesn't change. However, going forward, email communication involving the unmerged Contact email address isn't pulled into the Stream. If you have the SalesforceIQ iOS mobile app or Android mobile app installed, you can call a Contact directly from the Contact Gallery or the Contact Profile page. Click to the right of the Contact name and select Call. Under Contact Details, click the phone number. Note: If you don’t have one of the mobile apps installed, you’re prompted to install one of these tools when you try to call the Contact. Note: These same options are available for Contact Properties that have been added as Grid fields in a Contact-based List. As a best practice, you should use a List to manage a process, and use the Contact Gallery to manage Contact details. 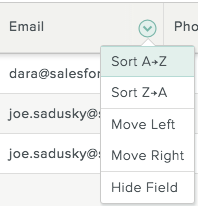 You can sort the Contact Gallery by any field in ascending (A-Z) or descending (Z-A) order. To open the Contact Gallery, click and select Contacts. 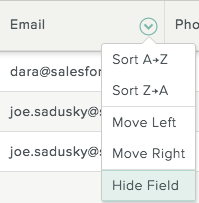 Hover over the field you want to sort by, and click to the right of the field name. Click Sort A-Z or Sort Z-A. 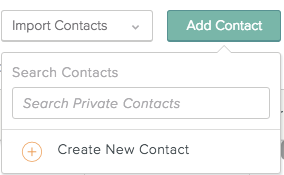 You can filter the Contact Gallery to display only Contacts that match the information you select. You can save your filtered options to easily access them anytime. Click Filters at the far right of the screen. Repeat steps 3 and 4 for any other fields you want to include in the filter view. In the Contact Gallery, click Filters at the far right of the screen, and then click the drop-down list at the top of the filters panel. Search for or browse to the filter you want, and click to apply it. The applied filter appears at the top of the Contact Gallery. To remove one or more options for a field highlight the field and uncheck the options to the left. To completely clear the filter view, click Clear All to the right of Filtered By in the filters panel, or click X to the left of Filtered By at the top center area of the screen. Reordering a field moves it in your Contact Gallery display only. 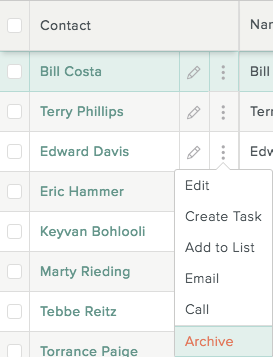 It doesn’t affect the field order in other users’ Contact Gallery. 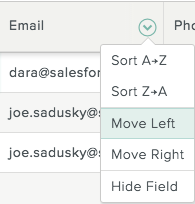 To move a Contact Gallery field to the left or right, simply click the field to select it, and then drag it to the position you want. To move multiple fields, hold down Shift and then click the fields. Hover over the field you want to move, and click to the right of the field name. Click Move Left or Move Right. 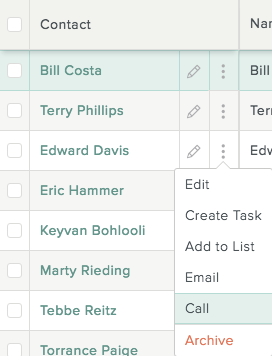 By default, the Contact Gallery displays all Contact Properties as fields. Hiding a field removes it from your Contact Gallery display only. Other users still see the field in their Contact Gallery. If you hide a field, you can restore it to your display. Hover over the field you want to hide, and click to the right of the field name. To show a hidden field, click that appears between the fields that are to the left and right of the hidden field.